SEO copywriting is an essential skill for satisfying both your human audience and search engine spiders, and this approach to SEO is a powerful form of SEO marketing. The only way to drive more sales for your business is to engage qualified customers through search engines, and this process is not easy. However, SEO copywriting continues to be one of the most effective aspects of your marketing strategy. Great content is the sum of its parts, and one of its most important components is SEO. Unfortunately, a lot of authors simply don’t understand how to take several aspects of SEO and apply them to online copywriting. By melding the tenants of both SEO principles and copywriting together you will be able to get found online by qualified customers and attract more sales to your site. Luckily, people who want to learn may take the following SEO writing hints and plug them into their internet content for better results. SEO copywriting is a necessary skill for pleasing both people and search engine spiders. In this informative article, we’ll cover five elements that are crucial for a successful search engine optimization copywriter, but that are often overlooked. If you want your businesses to succeed online, then you need to publish content that gets found by search engines and engages your customers. As an SEO copywriter must constantly focus first on creating content useful for their online audience rather than for gaining high search engine ranks. SEO copywriting plays a very important role because the only way to drive more sales is to get the attention of qualified customers. SEO copywriting balances elements to get content found online in search engines while also writing for your audience and boost online sales. You can use this tactic whether you are a consultant or information website, and you can use great copywriting to boost your ecommerce sales too! 1. Contains relevant keywords. This helps your content get found in search engines based on what people are searching for. 2. Help improve your online marketing, Google, and other search engines. 3. Engages qualify customers and drives more valuable traffic to your site for quality writing that speaks to your customers and helps answer questions if fulfill their needs. SEO copywriting has its roots in creating useful, compelling, and valuable content for your customers. Using specific keywords will help your content get found in search engines. By writing valuable content, you will be able to attract more qualified traffic to your site. When you produce great content that is optimized for search engines, you will be able to increase the authority of your website. If you have been running a website for several years then you need to conduct a comprehensive website audit to ensure that your website is optimized for the best performance. If you are not sure if your website is optimized then you should look into a website audit. SEO copywriting is not easy, but if you pull the specialized skilled off properly, you will be able to make more money online today. Why Is SEO Copywriting Important For My Business? Your business offers unique products and services to address the needs of your customers since your customers go online, to search for their solutions to their problems. You need to do everything you can to ensure that your business gets found online. While SEO marketing was focused on stuffing in keywords wherever you could and building backlinks, search engines have changed so your business strategy needs to change too. The importance of SEO lies in your online content and engaging with qualified customers. With quality content, you don’t have any incentive for people to remain on your website, and Google will take note. From each page they click to how long they remain on it, Google is seeing, and when your content isn’t keeping traffic on your website, your ranks fall. SEO copywriting will make or break up your search engine optimization strategy. This is because you need to make content that your customers will love, and you also need to craft that content in a way that gets found by search engines. If you only focus on getting found or if you fail to create content that resonates with your audience then you will waste a lot of time and resources on marketing materials. Writing content that is optimized for search engines and tailors to meet the needs of your customers is not easy. SEO copywriting is the result of market research and a solid understanding of your customer’s needs. SEO copywriting plays a central role to help you attract qualified leads to your site and drive more sales through your online content. You can customize your online content to meet the needs of your customers with technical details to align your content with how Google and other search engines understand your online content. By getting found online, your business will drive more traffic to your site and by creating content that answers questions and addresses the needs of your customers, you will be able to help your customers find your website and make more sales for your business. SEO copywriting is one of the most powerful factors that you should consider for your online marketing strategy! SEO copywriting is all about crafting content, so compelling that other people want to promote it, link to it, and share it on social media. SEO copywriting is the basis of producing a successful site which does not just brings clients to your website but retains them, raising their probability of getting your client or customer. When your company wants to drive more sales to your site and convert more customers. To help you build better content for your website here are the 5 tips to rank including ideas, strategies and techniques can allow you to accomplish your audience and also become a much better author. Here are five tips to rank your SEO copywriting projects today. 1. Focus on long tail keywords for your keyword. Instead of wasting money and time, trying to rank for highly competitive keywords as much better to focus your time and resources to rank for longtail keywords in your content. 2. Remember to optimize metadata. Focus on elements of your content like title, Meta description, internal linking, and keywords to drive more qualified traffic to your site. 3. Write content for your buyer personas. You are not able to write relevant content if you don’t know who your target audience is and what their needs are. 4. Format your content for mobile devices. Your content needs to be easy to read. If you want your customers to stay on your content and consume your message. 5. Off page SEO strategies. This includes things like outreach, social media engagement, and building your online reputation. You can begin to rake your content with these five SEO copywriting tips today! If the content is great, there’s a substantial probability that the blogger will share it to his or her own channels. Here is the very best manual to blogger outreach I understand. Make certain that you look at this post as I think it could help save you from most common mistakes. Writing content optimized for search engines is both a science and an art. The science part of SEO copywriting is how you can optimize your content to get found in search engines using signals that Google and other search engines require. The art side of SEO copywriting is to craft content that your customers want to read and find valuable. Your business can only bring together the best of science and art with SEO copywriting by combining the sides that can help you drive qualified leads to your site and close more sales today! 1. Write for your audience. Many companies start producing content without thinking about who is going to read it. Be sure to understand what your audience is asking online. 2. Create powerful headlines. You need to make a big impression online to stand out and serve so you can use power words by your audience when you create content that appears in search engines. 3. Format your content to be read easily. I like to keep each paragraph around two sentences and add bullet point lists. In each section of my texts, I keep each section to about 200 words or integrate keywords into your content. I like to put keywords in my titles and H2 headers. This tells search engines and my readers the exact topic of my content. 4. Use questions in your content. You include exact match questions in your content. Then you have a better chance to rank in search engines and convert prospects to customers. There are many tips and tricks for online marketing, but you can skip all the B.S. and use copywriting tactics that get results for your business without having to worry about wasting time or effort. Use these tips to create awesome content that ranks in search engines and engages with your customer! What Are The Most Important Parts Of SEO Copywriting? There are many components that you need to consider if you want to create content that ranks in search engines and engages with your audience. SEO copywriting is an exercise in using your native language to affect a person to have a particular action. Normally, that activity is to get a service or product. From time to time, however, copywriting is utilized to market your business for improved brand awareness, education, and direct sales. SEO copywriting combines the very best of both worlds between marketing and copywriting. SEO copywriting helps get content found online, engage qualified customers, and drive more sales. It generates content which doesn’t only ranks well in the research results but also convinces readers that they ought to do it. Here are the most important parts of SEO copywriting that you need to consider as you think about your marketing strategy. 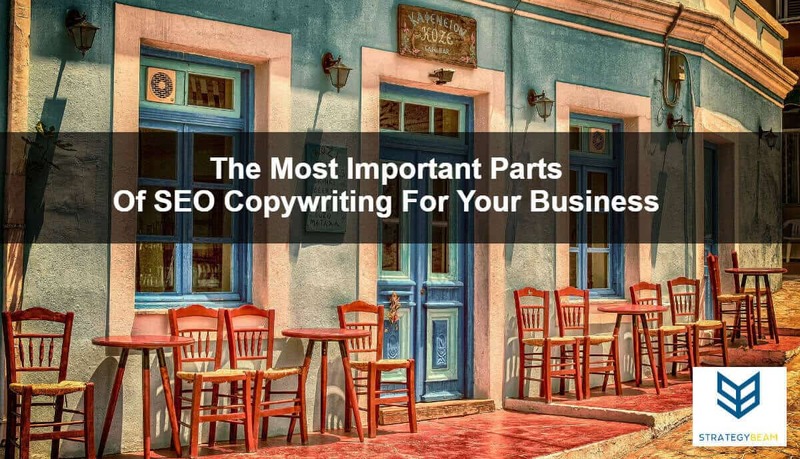 Here are the most important parts of SEO copywriting. 1. Use natural language for anchor text as you’re linked to different pieces of content on your site. Anchor text can help drive customers towards a purchasing decision with actual language and anchor text also provides context to Google. 2. Write to your human audience. While the technical components of SEO copywriting are important, nothing is more important than addressing the needs of your audience. Google considers behavior metrics in the ranking algorithm so you should do everything you can to keep your readers engaged with your content. 3. Answering the questions that your customers have. When people go to Google, they ask a question. This means that it is in your best interest to provide answers to the questions that your customers are asking. 4. Create memorable headlines. One way to get more customers to read your content is to write engaging headlines. You can use these SEO copywriting tips today to drive more qualified leads to your site and close more sales. SEO copywriting is still an acquired ability, but it will become second-nature as soon as you know what your clients need and understand how to help them achieve it. I hope that you find this informative article on SEO copywriting helpful for your promotion strategies. SEO copywriting is an essential part of your SEO strategy. It is crucial that you copy relies on a well-researched, keyword-based subject that contains keywords and semantically related words during the articles when staying valuable, well-optimized, and interesting that people read.